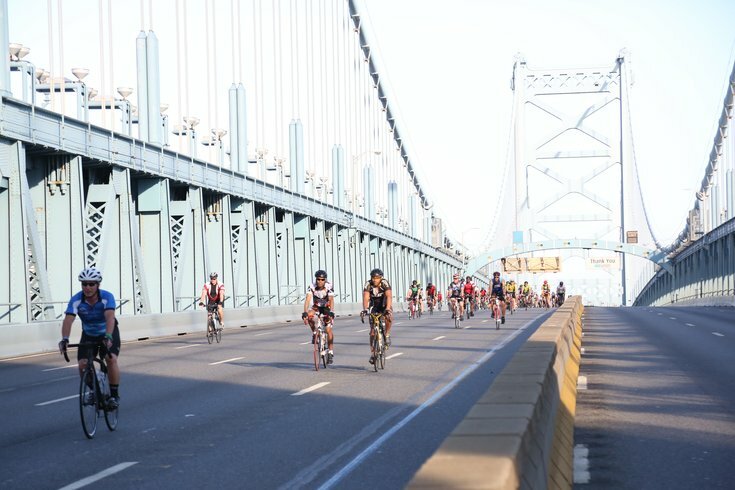 A photo of cyclists riding over the Benjamin Franklin Bridge during Tour de Shore 2016. There are only a limited number of spots still available for participants in the 31st annual Tour de Shore, taking place Sunday, July 29. The charity bike ride will hit capacity at nearly 3,000 riders. This year, the ride will follow a new route. Riders will begin at Franklin Square in Philadelphia and end at the Showboat Hotel in Atlantic City, N.J. In addition, the Tour de Shore added a second starting point for anyone wishing to ride 50 miles instead of 65 miles. The "Tour de Shore Lite" will take off from Berlin, N.J.
"We're thankful that this ride continues to get bigger, and Franklin Square is the perfect spot to give us more room and better access to public transit and the parking we need to accommodate the new growth," said Joe Sullivan, President of the Tour de Shore Children Foundation's board of directors and Philadelphia Police Deputy Commissioner. Until this year, participants in the Tour de Shore would cycle from the Irish Pub at 20th and Walnut streets to the original Irish Pub location in Atlantic City. Registration for the ride is $75, with a $200 fundraising minimum. Money raised from the Tour de Shore goes to support the families of fallen first responders and children in need in the Greater Philadelphia and South Jersey area. The goal is to raise $1.25 million this year. Ride participants can attend the after-party at the Showboat for free. Friends and family are welcome with a $20 donation.